Here you have one made for yourself; elitely! Three different fabrics in one kurta where the front portion is nicely crafted with tanchoi silk where as velvet brocade is crafted precisely in the collar & around the placket. Not to forget the sleeves as they are made up of gheicha silk and cuffs having touch up of both the front fabrics that makes a male look classic. Try it out and youÆll see the difference! 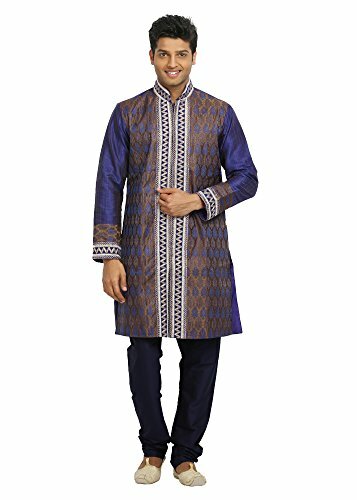 Three different fabrics in one kurta where the front portion is nicely crafted with tanchoi silk where as velvet brocade is crafted precisely in the collar & around the placket. Not to forget the sleeves as they are made up of gheicha silk and cuffs having touch up of both the front fabrics that makes a male look classic.